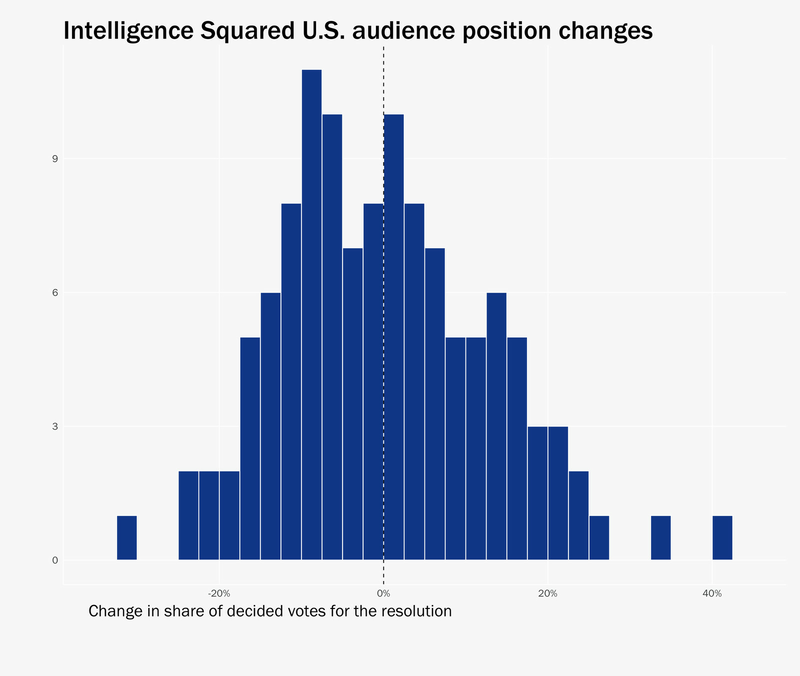 I’m a big fan of the Intelligence Squared US (IQ2US) debate program, so when I learned that the program had compiled data on the 119 debates it had held since 2006, I was eager to dive in. And in doing so, I learned a few things: People do change their minds a fair amount. They are more likely to change their minds on science and technology issues; on politics and economics, opinions tend to be a little more stable, though still somewhat fluid. Also, what appears to be consensus at the start of a debate is often illusory. Yes, this is a small and nonrepresentative sample with a self-selected audience — and generally thoughtful debaters on both sides. But the relative fluidity of opinion is important. It suggests that ideas and arguments can actually matter, and that when both sides get a fair and equal shot to make their case, minds can indeed be swayed. This matters because ideas and arguments are in fact an important part of how politics actually works. Contrary to simple explanations that it’s all about the campaign contributions or partisanship, considerable lobbying takes place on issues where the public is not deeply engaged enough for it to be partisan, and where there is campaign money sloshing around on both sides. Significantly, there are many issues with which lawmakers and their staffers don’t have much expertise, and where they are relying on the arguments that come before them. The problem is that these arguments are often one-sided — for every $1 spent by public interest groups and unions, corporations spend $34. I’ve frequently arguedthat if we could level the playing field and balance out the arguments on both sides, we’d have a more reasoned debate that might result in better public policy. Obviously, lawmakers, their staffers, and other policy elites have more external pressures and obligations than your average IQ2 audience member, voting anonymously in an auditorium. But thoughtful presentations and good arguments do make a difference. The quality of debate matters. 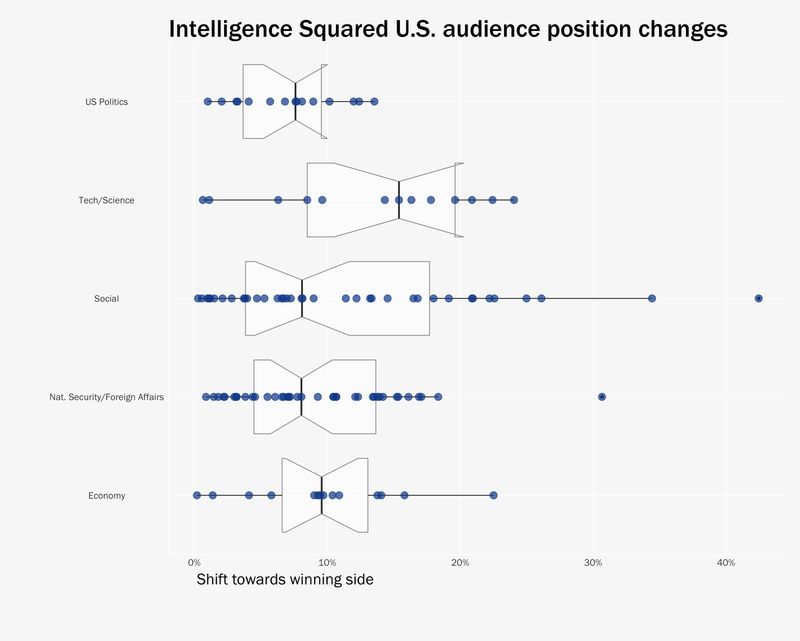 Before proceeding to the analysis, a few quick points on how Intelligence Squared US debates work. Before the debate starts, audience members are polled on whether they support, oppose, or are undecided about the resolution up for debate. After the debate ends, audience members are polled again. The winning side is the side that gets the biggest shift in its direction between the start and finish of the debate. The first observation that comes out in looking at the data is that audiences do change their minds. Quite a bit. To measure this, I calculated the share of decided votes for the resolution before the debate, and the share in decided votes for the resolution after the debate, and then took the difference between the two. On average, the winning side sees a shift of 10.3 percent in the direction of the winner, which is pretty sizable. The distribution is pretty normal (it resembles the standard bell curve distribution). There are only a few debates with really big shifts. Graphic by Lee Drutman. Source: Intelligence Squared US. Intelligence Squared debates cover a bunch of different topics. My colleague Chayenne Polimedio and I broke the debates into five different topics, and then I compared the range of results across the different topics. One topic stood out: science and technology. The median shift on science and technology topics was 15.3 percentage points toward the winning side. By comparison, politics had the lowest median shift, at 7.6 percentage points. There are probably two related reasons for this. One is that audience members are probably the least informed, on average, on science and technology issues, so they have the most to learn and the fewest strong opinions coming in. The second is that science and technology issues tend to have the least overlay on existing partisan political positions, so audience members have the fewest heuristics for how to understand these issues, since few IQ2 debates make partisan cues explicit. However, there is one caveat in interpreting these results. In some cases, a fair number of audience members change their opinions in opposite directions, offsetting each other. Below I plot the pre-vote share for the resolution on the x-axis, and the shift toward thefor position on the y-axis. The simple takeaway here is that consensus is often illusory. Or, from the perspective of a debater: If you start off with a seemingly unpopular position, you’re more likely to wind up gaining support. But if you start off with a popular position, you’re more likely to lose support. This effect is strongest on technology and science issues, which fits with what we saw above — audience opinions are more fluid on these kinds of topics. In contrast, on economic and political issues, there’s much less correlation: A popular position is just as likely to gain support as an unpopular position on these two subjects. 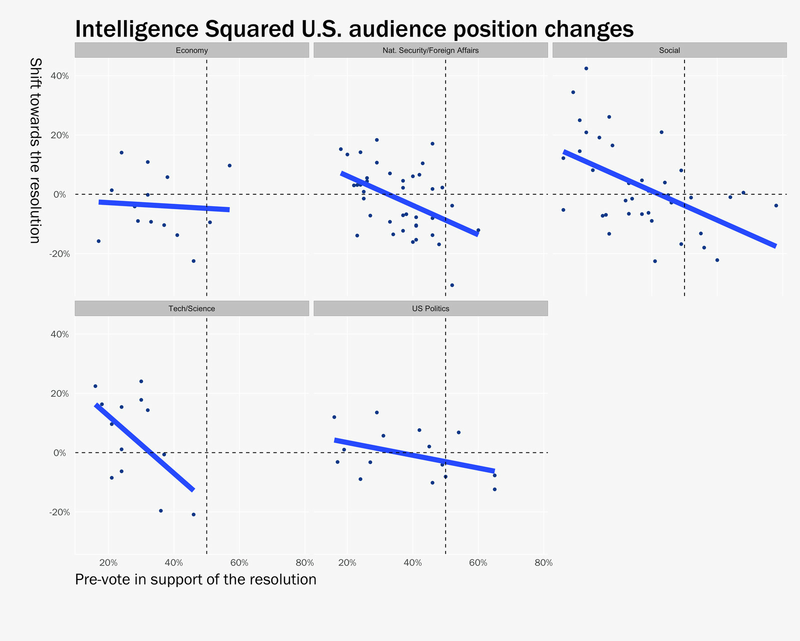 I asked Intelligence Squared US founder and chair Robert Rosenkranz over email what he thought of these results, and he was even more optimistic than me about people’s capacity to rethink their opinions. This post is part of Polyarchy, an independent blog produced by the political reform program at New America, a Washington think tank devoted to developing new ideas and new voices. See more Polyarchy posts here.